When you find your true soul mate, there isn’t anything that the both of you aren’t able of overcoming together. Sure, there are a lot of hardships or adversity that may have stuck obstacles in your way, but you both somehow managed to pull everything back together even when you both may have thought that there was no coming back from this. You would never find yourself in a situation where you’d think you’d have to leave the other person in order to satisfy a piece of their happiness that maybe you weren’t living up too. Despite the many challenges that have been brought before your relationship, you both took a stand and made sure that the two of you were going to be the last ones standing. Maybe not literally reading each others minds, but you both know each other so well that you pretty much already know what they are going to say, what they want, what they need, what they were going to do, anything. This is another way of knowing that you have your one true soul mate. Even when you didn’t even ask them for anything at all, they still somehow read your mind and bring you the thing that you were needing most in that moment in time. It comes naturally, not even trying to be close to each other, you both just know what’s going to happen next because it makes you both happy. Regardless of being each other’s one true soul mate, you both have not lost yourselves to one another. Meaning that you’re still the same personality type that you were when you first began being together. Of course, you both have probably made a lot of changes over the years, but your still the same people that when you first fell in love. This doesn’t happen in a lot of relationships and in fact some people lose themselves to the other person entirely. It’s important that you maintain this kind of bond with each other and not try to become something that either of you are not. Honesty is a very key element to any type of relationship. 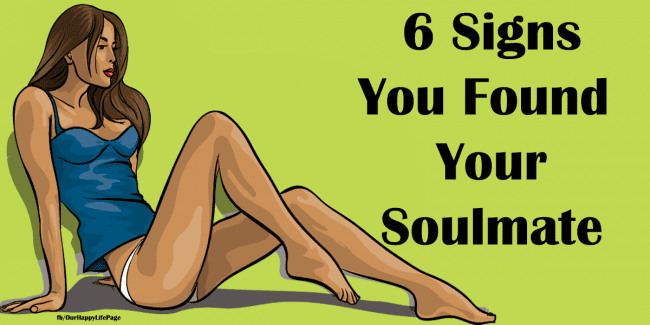 There may even be times where you begin to dream about your true soul mate. Your love for them is so powerful that you are literally constantly thinking about them even when you’re asleep. These dreams can be extremely vivid and put in just the right atmosphere. Of course, it is your brain so you would hope that you would go to a happy place whenever you think about your soul mate. Who know’s you might have been dreaming about them this entire time and didn’t even know it until just now. When you find your true soul mate, there is an overwhelming sense of adventure that sweeps over the both of you. This feeling that resonates inside you propels you both into doing things that you might not have ever saw yourself doing before. This is one of the signs when you know you’ve found a love so pure that you both can do anything in the entire world and you’d still both have an undying love for one another. You’ll probably go traveling together a lot, find new places that you’ve never seen before, meet new friends together, and everything in between. Your love fuels the ship and you both are the captains. Another huge sign that you have found your true soul mate is when they leave for a long period of time and find yourself not being able to do as well with things as you thought you could. For you, being away from your true soul mate is almost like giving yourself the biggest distraction from everything else that’s going on in your life. It’s not like you don’t care about the things you’re doing but that you would just be a lot better off if your soul mate came back to you once more. Their presence has a strong impact on the things you do because while you’re doing all of those things you’re thinking of them. This is what true love looks like for soul mates.